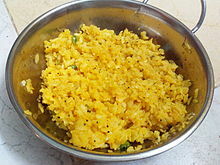 Pohe is a very popular breakfast dish in the Indian states of Maharashtra, Gujarat and Madhya Pradesh. Cover and cook for 5 min on low heat. Do not uncover in this time. The pohe must cook in the steam. This page was last edited on 10 June 2017, at 17:59.